While many employees may be comfortable in their current roles, it’s probably safe to say that most top talent want to continually advance in their career. Regardless of whether the goal is to be promoted within a company, or simply stay up-to-date on new skills or technologies  high performers of all generational groups want to improve themselves, so they’re better tomorrow than they are today. This reality is great news for businesses, which are increasingly focusing their operations on training. However, it’s equally important to make these training opportunities apparent to candidates, as this can encourage them to join your company’s ranks should they be extended a job offer. Companies have a lot of priorities throughout the year, and at the top of the list is strengthening employee training programs. In fact, 58 percent of employers in the Performance Management Study said training programs, as well as attracting and retaining top talent are major issues they intend to tackle in the new year. They’re wise to do so, not only because successful training improves work processes, but also because training is something that employees desire. Among candidates in the survey, external training was cited as one of their most preferred incentives for staying with a company. It’s easy to understand why. The job market is extraordinarily competitive and businesses are pulling out all the stops to find the most qualified people. Training gives current workers a leg-up on their competition in the marketplace, while also incentivizing job seekers to apply because of the potential to advance their career. Workers today aren’t just competing with other individuals – machines are vying with them as well. Artificial intelligence is used in a variety of industries, in part to reduce labor expenses. Some experts believe that AI will become more commonplace over time, particularly for positions that involve repetitive tasks. However, a recent Gallup poll found that Americans aren’t too worried about losing their jobs to robots, especially those with highly specialized skills. This may be because they have faith in the upward mobility that training can spur. In a separate Gallup survey, 43 percent of respondents said they’re confident about being able to take advantage of training to improve their skill sets in the event AI puts their job security at risk. Regardless of age group, leveraging training makes good business sense. Not only can workers benefit from training that will help them personally in their own career trajectory, but cross-generational training programs, such as mentoring and succession planning, can also help the organization ensure the next generation of employees are being prepped to lead the company into the future. Senior staff can also benefit by learning more efficient processes or technologies from younger workers who may be more adept with these platforms. Just as junior staff can learn from those older than them, senior staff can also benefit by learning about more efficient processes or technologies from younger workers, who may be more adept with certain platforms. Generation Z – those born from the mid-1990s to the early 2000s are particularly interested in training opportunities. According to LinkedIn, Gen Z is on pace to represent 20 percent of the American workforce by as early as 2020. Given their relative newness to the working world, they’re ready and willing to learn the ropes. Sixty-two percent of Gen Z respondents in a LinkedIn survey said becoming better at their job was the main reason why they were open to learning, more so than for salary or promotion purposes. Ultimately, top performers of all generational groups are driven to succeed. The quickest, most effective way of achieving it is through learning, which training provides. Be sure to mention training programs that are available to employees in job postings, interviews and reviews. 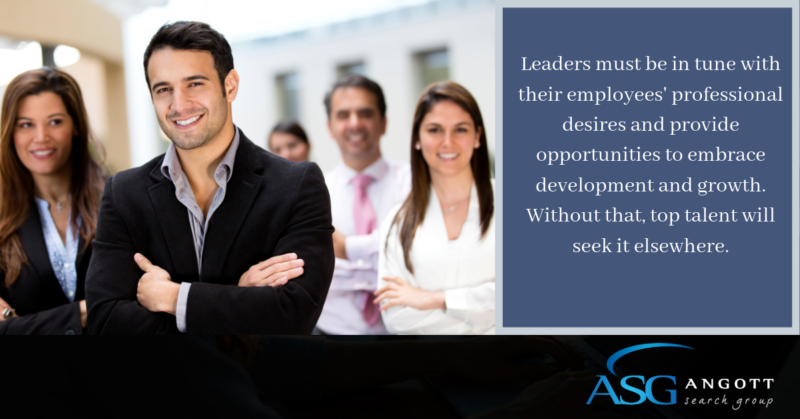 It’s a surefire way to attract and retain star talent.